It’s been a while since I played a true Dragon Quest game. After playing Dragon Quest Heroes: Rocket Slime I wanted to go back and pick up where I left off since Dragon Warrior 3. Yes, I’m dating myself - I last played Dragon Warrior 1-3 on the NES. Fortunately, with Dragon Quest IX, the formula is still pretty simple and many familiar enemies and relics await your arrival. The storyline is unique so you don’t have to play the previous eight games to enjoy this one. There are two worlds, the celestian world and the mortal world. The angelic celestians protect the mortals and are assigned to specific towns to watch over. Without giving away too much of the story, the premise is that both worlds are in danger and you must prove that the mortals are worthy of being allowed to live. The game starts with your mentor, Aquila, showing you the ropes of being a town guardian. The mortals cannot see celestians but believe in them through answered prayer. When you help them, they will give thanks thus creating Benevolence. In turn, you collect this Benevolence and offer it to the World Tree named Yggdrasil. There’s much more to do in the game besides answering prayers. Like many RPGs, you have to explore, talk to everyone, and fight lots of enemies for experience and gold. I like the fact that the enemies are no longer hidden and it makes it easier to avoid or target specific enemies. Later in the game you get to set your vocation. By default I was a minstrel which is a pretty well rounded character. You can also be a Mage, Martial Artist, Warrior, Thief, or a Priest. If you’re unhappy with your selection, you can change it again and keep your skill points, but you’ll be back at level one. Don’t worry; it doesn’t take long to regain levels again. To assist you in your battles, you can have up to three friends in your party. You can design your own characters or go with the token Mage, Priest and Martial Artist. Quests are a big part of this game and usually have good rewards. There\'s story line quests and side quests that you can accept by talking to the villagers. You\'re limited to a certain number of open quests; fortunately you can later decline doing them. More quests are available via wireless download. 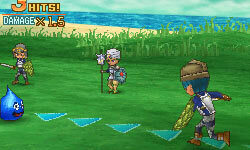 In fact, many of the DS features are utilized in this game. You can use the stylus to move around, but I preferred using the regular controls. The top screen displays the map and battle animations. The bottom screen shows your characters moving around and is where you control them in battle. The battle system can be as easy or as complex as you want it to be. You can manage your party by having them be in the front or in the back for less chance of being attacked. The preset AI attack styles are nice and include modes such as “No Mercy, Fight Wisely, Focus on Healing, and Use no MP (magic points)”. These presets are great for hunting for gold and experience but when it comes to boss battles, I highly recommend controlling all of the party members manually. When you’re in battle you can attack, try to flee, defend, analyze your foes, or use an item, ability, or a coup de grace. A coupe de grace is an extraordinary attack typically granted after you take a huge hit. For example, a warrior can get a guaranteed critical hit, a mage gets to use spells without using MP, and priests can summon angels to heal the whole party. Each class has their own unique coup de grace and abilities. When a character levels up, points are automatically assigned to attributes like strength, agility, magic, health, and so on. The skill points, on the other hand, are assigned manually. Each class has its own shared and unique skill abilities. The skills are typically weapon specific but there are shield skills and class skills too. If you max out a skill, it will go with you if you change vocations. The world is pretty big and the monsters get harder as you venture onward. There are many towns and the best way to replenish magic points is to stay at an inn. The further out the town, the more expensive the stay at the inn is. Make sure you visit each armor and weapon store to see if they have better weapons and armor than what you’re wearing. The better the gear, the more expensive it will be. The best way to upgrade your equipment is through alchemy. As you explore, make sure you keep an eye out for shimmering objects to collect and alchemize. The graphics appear to be 3D and I like how the battle backdrops are unique for each area that you are in. The enemies bring back memories and there are many familiar faces and even bosses from previous games make an appearance. There’s lots of variety, but many of the same models are re-used but with a different name and color palette. When you\'re in battle you\'ll see the enemy\'s attack animations and there\'s plenty of eye candy when it comes to magic use. The characters in this game are totally customizable by setting your eye color and hair styles. When you change your clothes and armor, your character will reflect the changes made. Some of the outfits can be a bit skimpy as you’ll run into belly dancers in some towns. Other appropriateness issues include violence and magic used in battles. Magic use is pretty inevitable if you want to survive. There are goddesses and nature worship and many references to ghosts and the undead. Some items and trinkets you can buy boast of satanic power. To offset the negatives, I can say that the story is uplifting and ultimately is about redemption. The music in this game is pleasant to listen to and I have caught my kids humming along with it. Some of the music is identical from previous games; for example, the game saving jingle at the church is the same. There is no voice acting, but the battles sound effects are great. There is a ton of replay ability, even after you beat the main quest. You can travel to other player’s games and play in their world. There’s a mode called Tag mode where you can share treasure maps with other players. These treasure maps often have good loot and tough bosses to fight at the end. There have been events at major retailers offering exclusive maps to players bringing in their DS’s with the Tag mode enabled. Dragon Quest IX also has a store that offers exclusive online content if you have a Wi-Fi connection. 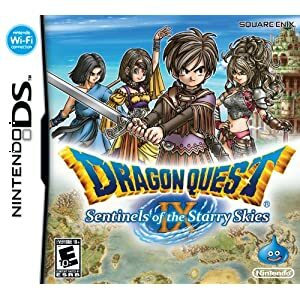 If you’re new to Dragon Quest or a veteran, this game is definitely a worthy purchase. Some may find it easy but I found the final boss and the Treasure map bosses to be quite challenging. There’s plenty to do between the main story, alchemizing unique items, and treasure hunting. I have easily spent forty hours playing this and there’s so much more I can do. You’ll definitely get your money worth if you don’t mind the magic and false religious concepts.